I didn't know what time Asuka's stage was going to start, so I arrived at 12:30. There were around 20 people in the crowd, some of them smokers. It was smoky during almost the entire event. Itou Asuka and Maru Maru Gakuen Housoubu's stage started at 13:10, and lasted for 25 minutes. I think all of the song were "short" versions, and not full length. For her solo song, Asuka wore a white one piece. 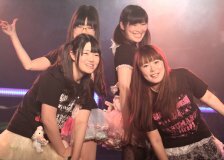 The other girls wore the Maru Gaku T-shirt and frilly skirt outfit. When Asuka came back onto the stage to sing with everyone, she also wore the same outfit. During Asuka's stage, I stood along the left wall (facing the stage) and took photos using a monopod. I ended up taking over 600 photos, with around 250 worth keeping.